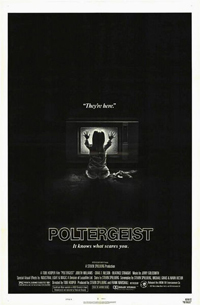 Proving, yet again, that my view of the world is strangely skewed, I actually think of Poltergeist as a, "kid's movie." But I've heard plenty of my friends classify this movie as, "one that screwed me up as a kid." or "a movie that scared the crap out of me when I was growing up." On a related note, did you know that Poltergeist is turning 30 this year? While it's commonly accepted that the movie is still wildly popular, I'd love to get my hands on some stats from places like Netflix, confirming how many people are still watching and enjoying it. Spielberg. Regardless of which rumors you believe about his level of involvement in the film, it simply drips with his style. And regardless of how you may feel about him or his movies, as I've written before, the man is a movie-making genius. Primal fears. While the guts of the story are comfortable, approachable, "everyday", and maybe even a bit silly at times - the "scares" are so basic and rooted in childhood that they continue to work (30 years later.) Fear of the dark. Monsters in our closet. What happens when we die? Storms. Clowns. Toys coming to life. Controversy, conspiracy, and mythos. Surrounded by untimely deaths, unique effects practices, and producer / director debates, everyone wants to muse over the various "curses" attached with this movie. And just for laughs, lets talk about that first point for a minute. Spielberg wrote and produced the movie. Tobe Hooper (probably best know for directing The Texas Chainsaw Massacre) directed the movie. There's endless amounts of rumor and conjecture about which of them"really" directed Poltergeist. And while I maintain that the movie simply stinks of Spielberg's style, the direction definitely has Hooper's stamp on it. People get too caught up in the story and have a near impossible time separating that from the direction. Shots, angles, framing, and the strange, silent way characters stare vacantly are all Hooper's doing. While the comfortable, suburban humor of the story is all Spielberg. The combination of their concepts made Poltergeist unique in the genre (at the time) and allows it to hold up, even now. And speaking of the story, Poltergeist has this undertone (as do many 80's horror flicks) of "something lurking beneath the surface." It's the rotten apple metaphor - this idea that everything looks so perfect on the outside but is evil on the inside. While popularized in the 80's, this idea is not new to horror, growing out of classic gothic fiction. To this point, Poltergeist actually ends as all gothic tales do: with the destruction of the home. The place it strays the most is in the hidden evil: in a true gothic tale, the family would be hiding a malevolence while in Poltergeist it's the culture or community that's harboring something terrible inside. ...And, unsurprisingly, there's a 2015 remake in the works. Okay - I'm thinking it's wrap up time here. Children of the 80's, join me in thanking the movie industry for scaring us into the horror fans we are today. Or something like that.